The Cayuga Wine Trail marked its 25 anniversary this week. Located on the eastern end of the Finger Lakes region in Upstate New York, its the home of the first vineyards that I ever visited and still is one of the most picturesque places in the world to taste wine. Owners of four Cayuga Lakes vineyards conceived the started the wine trail 1983. It was the first organized wine trail in the United States. There are now 16 wineries on the Cayuga Wine Trail and they average 50,000 visitors each on an annual basis. For most, the sales to wine tourists and the word of mouth marketing created by the trail is their life's blood. To mark the anniversary wineries on the trail plan a number of events. You can check them out at http://www.cayugawinetrail.com. The BBC is reporting that a restaurant fire at the historic 15th Century Black Friars Distillery in Plymouth, England, has been contained and did not damage the distillery section of the complex where Plymouth Gin is made. The Barbican Kitchen Brasserie, owned by U.K. celebrity chefs James and Chris Tanner, was severely damaged, but quick work by fire crews and the heavy construction of the centuries old building halted the spread of the blaze. Residents living close to the distillery were evacuated when the fire was discovered in the restaurant kitchen as a precaution because of the proximity of the distillery to the flames. Formerly a monastery for Black Friars, the distillery has been the home of Plymouth Gin since 1793. 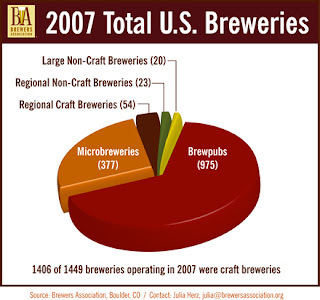 The Brewers Association and the beer blogosphere is making a pretty big deal about the 2007 sales results for the craft beer segment. Craft beer sales are up 12 percent, a pretty big jump considering imports and non-craft domestics each reported a sales increase of 1.4 percent. -- Most people still prefer to pound back non-craft beers. 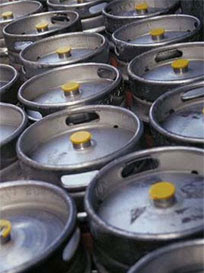 The total U.S. beer market in 2007 was 211,489,982 barrels. The total domestic craft segment accounted for just 8,011,141 million barrels of that total -- about 3.8 percent of the total volume. -- Contract brewing barrels were up 27 percent to 1,290,204. Depending on how you look at this number it is either good or bad. In some cases this is driven by small brewers who have out stripped the capacity of their facilities and need the contract space to keep up with demand. In other cases it might be some players either unable to raise the capital for their own brewery or who see a profit opportunity, but do not want to risk heavy investment. -- The overall number of breweries in the U.S. was up by 12 last year to 1,449. Still 23 brewpubs and 17 microbreweries closed. For the most part these represent failed dreams, some poor management, tough marketing times and the challenges of making great beer. Still 44 brewpubs, 38 microbreweries, one regional brewery and one large brewery opened. More than a few of these are making some pretty darn good beer and will help fuel future growth. -- Brewpub capacity growth lagged the overall craft category, up just 3 percent to 719,874 barrels. Brewpubs have always been the smallest part of the craft niche, but they are also often the closest to the consumer and the place where most Americans get the chance to see, smell and taste where beer is born. They should be serving the freshest beer in America. Slow growth in this part of the segment might signal a trend to watch. -- The U.S. beer market is a $97 billion industry. Craft beer contributes $5.7 billion to that total. There is plenty of room for continued growth for the better players. The key will be consumer reaction to rising beer prices and whether shortages of key raw ingredients cause a shift in beer styles that has an impact on the craft segment's growth. Charity Wines is rolling out four new labels that recognize baseball heroes and help raise funds for charities. Ernie Banks 512 Chardonnay, a 2006 California chardonnay, benefits the Ernie Banks Live Above & Beyond Foundation, which works to eliminate prejudice, support programs that enhance neighborhoods and relieve discrimination among various age groups and races. Eddie Murray 504 Cabernet Sauvignon, a 2006 California cabernet sauvignon, raises funds to support the Baltimore Community Foundation, which makes grants to a number of charitable organizations including schools for at risk children. Mike Schmidt 548 Zinfandel, a California zinfandel, benefits The Cystic Fibrosis Foundation, which is working to find a cure for cystic fibrosis and to improve the quality of life for those with the disease. Brooks Robinson Chardonnay, a 2006 California chardonnay, supports the Baltimore Community Foundation, which makes grants to a number of charitable organizations. You can get more information on these wines and other sports personality labels at http://www.charitywines.com. Anthony Alba, who has been tending bar since 1999, has won the Stella Artois U.S. Draught Master Competition held this week at PURE Nightclub at Caesars Palace in Las Vegas. Alba will go to Leuven, Belgium, in October to represent the United States at the Stella Artois World Draught Master Competition. Alba had to show judges he had mastered the "Belgian Pouring Ritual," a nine-step process that includes “purifying” the glassware; “sacrificing” the first beer poured and “beheading” the beer for the perfect head of foam. The timed competition took place in front of a panel of six judges. 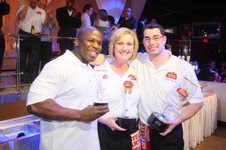 The competitors had to pour Stella Artois and Hoegaarden from draught and bottles of Stella Artois, Hoegaarden and Leffe Blonde. Alba beat out Darlene Perales, who finished second, and Genie Gene, who finished third. People in Indian Trail, N.C., will go to the polls in May with the chance to end Prohibition in the community. The Indian Trail Town Council voted 4-1 to allow a referendum on whether restaurants and hotels in town will be allowed to sell beer and wine. The proposal was a compromise that stripped away chances for a North Carolina ABC store to be located in the town. That part of the proposed referendum was eliminated, keep spirits from being sold. Restaurants in the community support the measure. The Town Council has been under pressure from anti-alcohol forces who have been trying to keep voter from having a say on the issue. If you run across Matt Venzke of Yorktown, Va., at some point during the next 12 months you may want to bow, you will certainly wish to shake his hand and I'd suggest you buy him a beer. Venzke is the 2008 Beerdrinker of the Year, having won Wynkoop Brewing Company’s 12th annual contest. Venzke earned the honor on Saturday at Wynkoop in Denver. As proof that persistence pays off, this was his fourth time at entering the contest. He was a semifinalist last year. Venzke finished ahead of J. Mark Angelus of Oregon and Richard Pedretti-Allen of Texas. Venzke is well qualified to carry the title during the next year. He has visited 454 breweries in 16 countries and 39 states. Over the past five years, he has recorded tasting notes on over 3,200 different beers in 69 different styles. As the 2008 Beerdrinker of the Year, Venzke wins free beer for life at Wynkoop Brewing and a $250 beer tab at the Taphouse on Queensway, his home bar in Virginia. It is the second year in a row that the Beer Drinker of the Year has come from Virginia. Tuesday Tasting is a regular feature of Lyke2Drink that explores some of the best beers, wines and spirits on the market. This week we sample an 18- and 42-year-old Scotch. Bowmore is one of the top 10 Scotch brands worldwide. The Islay distiller has been around since 1779. Islay, part of the Hebrides off the west coast of Scotland, is known for its intense, peaty single malts. 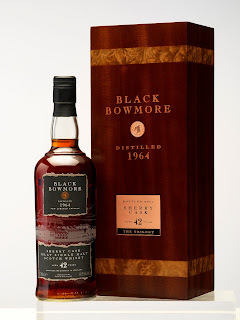 Thanks to Anne Riives, who handles PR for Bowmore in the U.S., I had the unique opportunity recently to try a pair of Bowmore's best, including the rare Black Bowmore 42 Year Old. Distilled on Nov. 5, 1964, Black Bowmore has been quietly aging in a below-sea-level cellar along Loch Indaal. Five casks pulled out of the cellar for this bottling yielded 827 bottles. Just 80 were shipped to the U.S. this month. The price tag is a heart stopping $4,500 a bottle, but it does comes in a mahogany box inlaid with maple burl and copper. The sample I tasted was a dark cola color. There is clear influence from the Oloroso sherry casks where the malt was aged for more than four decades. Coffee, a hint of cocoa and the signature Islay smoky peat rounded out the experience. I doubt the 80 bottles shipped to the U.S. will be available at retail for very long, even at the exceptional price. This is the fourth time Bowmore has released special whisky from this vintage. In 1993 it was a 29 year old priced at $100 a bottle. A 30 year old rolled out in 1994 and a 31 year old in 1995, priced at $200 a bottle. Occasionally some one still finds one of these bottles at retail for near the original price. That is a truly lucky shopper. At a spirits auction held in New York in December the three age expressions of the vintage were sold in a lot for a bid of $18,000. Collectors prize this stuff. If you cannot afford the 42-year-old, you should give Bowmore 18 Year Old a try. At $85 a bottle it fits into the affordable luxury category. This whisky is a rich copper color and has a lovely sweet nose. At 86 proof it has a mellow smoky flavor profile with hints of dark cocoa and tobacco around the edge. A unique feature of the Bowmore Distillery that is a big hit with whisky lovers is the five cottages on the distillery property recently renovated and available for rent by guests. Islay attracts a steady stream of tourists and these lodgings are difficult to book. Your best bet is to plan ahead and send an email to info@morrisonbowmore.co.uk. Most textbooks comparing beer, wine and spirits will use 5 percent alcohol by volume for beer, 12 percent alcohol by volume for wine and 80 proof (40 percent alcohol by volume) for spirits in the examples matching the strengths of each product. In the last few years, high gravity beers have picked up steam and have grabbed a greater share of the market. Several states have passed bills recently to allow the higher strength beers to be sold. Some argue that while these beers are attracting consumers, that there should be more session beers available, under 4 percent alcohol by volume. Now a debate is starting in California over a trend among a number of wineries marketing red wines that are up to 16 percent alcohol by volume. Winemakers continue to chase riper, full flavored reds. To get there, harvests are often delayed to build up the big red character in the wines. When you get concentrated fruits and a chewy feel to the wine, this also means the grapes tend to be ripper and have more sugar. The additional sugar converts to more alcohol once the juice is fermented. During a recent trip to California I encountered a number of reds -- particularly cabernet sauvignons and Bordeaux-style blends -- that were above the 14% alcohol by volume mark. California wineries are blessed and cursed by this fact. On one side are some retailers who do not want to sell the higher alcohol wines and some consumers looking for lighter reds. On the other side are two strong forces: one is nature, the growing conditions in California allow grapes to be left on the vine longer and hot weather further intensifies the flavors and the sugars; and the other is marketing, which has done a terrific job promoting the big red as the quintessential California wine. As longer as consumer demand exists for these big, bold reds, winemakers will produce them. Up to this point most consumers have either not noticed or don't mind that these wines come with 20-30 percent more alcohol. More than 30,000 Georgia voters have signed a petition to ask the state to allow retailers to sell alcohol on Sundays. The Georgia House and Senate may take up the measure because they are already slated to consider proposals that would allow Sunday beer sales at a new baseball stadium in Gwinnett; enable Internet wine sales from Georgia farm wineries to consumers in the state; and permit limousine services to serve alcohol to customers. Supporters of the bill are racing the clock as the Georgia legislative session heads into its final weeks. Last year a bill to allow Sunday sales died in committee. The Georgia Christian Coalition has come out against the proposal and Gov. Sonny Perdue, who does not drink, is said to be against the measure. He could veto any bill passed by the legislature. The Georgia petition in favor of Sunday sales can be found at www.petitiononline.com/GASB138/petition.html. Another website, votesundaysales.com, was started by retailers supporting the move. The world of big beer is likely to get smaller as we move through 2008. No, this is not a prediction that the giant brewers will suddenly give up huge share points to regionals and microbrewers. The fact is that some of the big guys are talking and we are likely to see at least one significant combination in the next few months. In October 2007, SABMiller and Molson Coors Brewing Co. signed a letter of intent to combine the two companies' U.S. and Puerto Rico operations. That same month, Dutch brewer Heineken and Carlsberg of Denmark formed a consortium to acquire Scottish & Newcastle, the United Kingdom Brewing giant. When moves like these are made they tend to cause shareholders of other breweries to take notice and a few proposals to get tossed around board rooms. One of the more interesting potential proposals comes in the form of a union between American giant Anheuser-Busch and InBev, the Belgian conglomerate. A-B already handles the U.S. import duties for several InBev beers, including Stella Artois. The new company would pass SABMiller as the world's largest brewer. Diageo, the London-based drinks firm which controls Guinness Stout and Johnnie Walker Scotch, has been rumored to be looking for a strong beer partner. Names like SABMiller, Heineken and Anheuser-Busch are mentioned in news reports as possible merger targets. China Resources, which has a partnership with SABMiller, is also on the acquisition trail to keep up with a 20 percent growth in demand for beer in China. While they are more likely to make a domestic purchase, China Resources has to be viewed as having the capacity to look outside of the country as well. Other international players, such as Lion and Nathan and Foster's Group out of Australia, Turkey's Efes Breweries, FEMSA of Mexico and India's UB Group could play a part on the international stage. Vijay Mallya, the billionaire behind UB Group, controls the Kingfisher beer and airline brands, Mendocino Brewing Co. in the U.S. and acquired Scotch maker Whyte & Mackay in 2007. The major concern for beer drinkers in the U.S. with any of these proposed deals is the potential impact on distributors. A shift of brands could cause a distributor pay less attention and even drop smaller brands. That has spelled bad news in the past for domestic craft labels and smaller imported brews. Viktor Oliva, an illustrator and painter, attended the Prague Academy of Art and the Munich Academy. He is mainly recognized for his Art Nouveau style work. 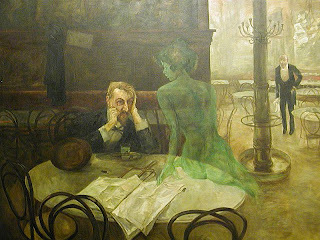 His most famous painting the Absinthe Drinker hangs in the Cafe Slavia in Prague, Czech Republic, where Oliva spent many days. Oliva discovered absinthe while in Paris, living and drinking among other artists. The ghostly green visage in the painting brings to life the alleged mind-altering qualities of the absinthe of the day. After returning to Prague he became the art director at a leading magazine and also was commissioned to paint the ceilings of several buildings in Bohemia. Virginia has taken another step forward in liberalizing blue laws when it comes to the sale of distilled spirits. The Virginia Senate passed a bill permitting Virginia ABC stores to open on Sunday in cities with populations of at least 100,000, meaning consumers in places like Portsmouth, Hampton, Newport News, Richmond and Chesapeake may soon be able to purchase distilled spirits on Sundays. Virginia ABC stores are already open on Sundays in Fairfax, Arlington, Loudoun and Prince William counties, and in the cities of Alexandria, Fairfax City, Manassas, Manassas Park, Norfolk and Virginia Beach. Nationwide consumers can buy spirits on Sunday in 34 states. A report in this morning's Wall Street Journal indicates that Attorneys General from a number of states have subpoenaed Anheuser-Busch and Miller Brewing, looking into how those companies market caffeinated alcohol drinks and whether they are targeting underage drinkers. Government lawyers from New York, Maine, Maryland, Arizona and Iowa are focused on the popularity of energy-style drinks with young people and whether claims are being made by the brewers about the power of the caffeinated drinks to fuel late night drinking. The U.S. Alcohol and Tobacco Tax and Trade Bureau approved the labeling for the brands and took no action on an earlier request from the states to clamp down on the products. The Attorneys General are under pressure from anti-alcohol groups who claim these products are dangerous and are designed for underage consumers. There has been plenty written across the beer blog world about the impact of hop and malt shortages on the cost of a pint of beer. Add to that surging energy costs and what that does to the price of things like aluminum and the result is a giant hangover for the industry. The little guys are hit hard, but much of that is under the radar. For publicly traded companies the blood and bruises go on full display when earnings reports are issued. 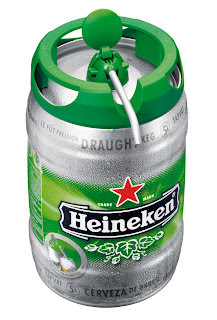 Heineken NV of the Netherlands has released figures showing its annual profit dropped by 33 percent to $1.19 billion. The Dutch brewer's results were below analysts predictions, causing a 6 percent drop in its stock. While it may be difficult to feel all that bad for a company reporting a billion dollar profit, the company says it expects a further crunch in 2008 with costs for key inputs going up 15 percent. Heineken is boosting beer prices by 3 percent to 4 percent in most markets, except for the U.S. Heineken took a price increase here last year and it faces fairly tough competition from other imports, craft beers and premium offerings from domestic giants. When I published my list of the Top 50 Greatest Drinking Songs of All-Time back in August 2006 it caused a few debates and remains as one of the top viewed entries on Lyke2Drink. With a little help from some friends and suggestions from loyal readers, I've decided to revise and expand the list. After all, music and drinking just kind of go together -- especially in these tunes. 2. All My Rowdy Friends Are Coming Over Tonight -- Hank Williams Jr.
15. Family Tradition -- Hank Williams Jr.
17. There's a Tear in My Beer -- Hank Williams Sr.
35. Whiskey Bent and Hell Bound -- Hank Williams Jr.
100. Honky Tonkin -- Hank Williams Sr. Honorable Mention: All My Rowdy Friends Have Settled Down (Hank Williams Jr.); Barstool Mountain (Johnny Paycheck); Bartender (Dave Matthews Band); Cold Beverage (G. Love & Special Sauce); East Bound and Down (Jerry Reed); Gotta Get Drunk (Eddie Spaghetti); Honky Tonk Masquerade (Joe Ely); Hair of the Dog (Dale Watson); Homemade Wine (Ozark Mountain Daredevils); I Got Drunk (Uncle Tupelo); I Had to Get Drunk Last Night (Gary Stewart); I'm Home Gettin' Hammered While She's Out Gettin' Nailed (Banjo & Sullivan); If You Don't Start Drinking, I'm Going to Leave (George Thorogood); Irish Drinking Song (Flogging Molly); Pass the Courvoisier (Busta Rhymes); Please Operator (Garth Brooks); Rehab (Amy Winehouse); Saturday Night's Alright (Elton John); Since I Started Drinking Again (Dwight Yoakam); Tequila Sheila (Bobby Bare); Tequila Talking (Lone Star); The Blarney Stone (Ween); The Bottle Let Me Down (Merle Haggard); What Made Milwaukee Famous (Jerry Lee Lewis); What's Your Name (Lynyrd Skynyrd); Whiskey and Wine (311); Whiskey, If You Were a Woman (Highway 101); Whiskey in the Jar (Metallica); Whiskey Rock 'n Roller (Lynyrd Skynyrd). National IPA Championship: Can You Pick the Best IPA? The annual March Madness NCAA Basketball Tournament generates more office pools than perhaps any other event besides the Super Bowl. But while Super Bowl pools usually come down to the dumb luck of selecting the right square out of 100 options, March Madness challenges basketball geeks to predict a flurry of games between the nation's best teams. Upsets can turn the novice into a champion and make the avid fans who spend their evenings flipping between ACC, Big East, Pac 10, Big 10 and SEC games look like rookies. Now the folks at Brewing News -- where I write the Business of Beer column -- have come up with a brilliant beer related version -- the National IPA Championship. It is a single elimination bracket featuring 32 of the best IPAs from around the country. It is a hophead's dream come true. The National IPA Championship starts with the preliminary round on Feb. 23rd in Grand Rapids, Mich. You can make your picks at www.brewingnews.com/nipac. All contestants that correctly predict the winners of every round and the final champion will be included in a NIPAC Contest Winners Drawing. Prizes include a full case of beer from the 2008 National IPA Champion, tee-shirts, posters and brewery merchandise. That's right free beer and free beer swag! Judges for the head-to-head face offs between the IPAs will be brewers. They will be organized into panels of 3, and given the task of choosing the best IPA between two beers. The judges will not know what beers they are being served. At the completion of the judging session, the names of the beers will be revealed to the panels and audience at large. The winners will be posted to the web site within 24 hours. Mississippians for Economic and Beverage Advancement (MEBA) is working to try to free a bill currently held up in the Mississippi Senate Finance Committee that would raise the alcohol by weight maximum in the state for beer from 5percent to 17 percent. According to Craig Hendry, one of the founders of MEBA, the group visited the state capital this week to discuss the measure with lawmakers and even had a chance meeting with Gov. Haley Barbour. Hendry reports the problem is that beer distributors in the state have lobbyists working to kill the bill. The tactics they are using include keeping it bottled up in committee and not allowing the full Senate to vote on the measure. The group has launched an effort to get craft beer fans in the state to contact Sen. Dean Kirby, chair of the Finance Committee, and ask him to allow the bill to come up for a vote before it expires. Information on MEBA's activities can be found at http://www.meba.ms/ and http://www.msbrew.com/. It has been 16 years since Bourbon has been made at the Charles Medley Distillers plant in Owensboro, Kentucky, but that is all about to change. Trinidad-based rum producer Angostura Limited is pumping $25 million into the distillery and plans to also open a cooperage to make barrels. The move is another sign of the growing global demand for Bourbon and what is expected to be tight product supplies in the coming decade. Angostura says when the distillery reopens it will be capable of making 3 million proof gallons of whiskey. It takes one half gallon of alcohol to make a proof gallon. It will be at least four years before any Bourbon from the facility hits store shelves. Angostura also purchased the former Seagram's distillery in Lawrenceburg, Ind., in 2007. NASCAR and bootleg moonshine share a common history in the southeastern United States. It is only fitting that for the 50th Daytona 500 taking place next week that a legal moonshine company is sponsoring a car in the sport's premier race. Piedmont Distillers of North Carolina is sponsoring Jeremy Mayfield’s Haas CNC Racing entry in the Daytona 500. The number 70 car will be promoting Junior Johnson's Midnight Moon brand. Johnson, who won the race in 1960 and ran illegal moonshine in his youth, is also driving the pace car for the big race. Mayfield first competed in NASCAR’s top series in 1993. He has five wins and has earned more than $32 million in his career. The Haas 70 car is locked in the field for the race thanks to finishing among the top 35 cars at the end of last season. Mayfield has to be considered a long shot in the field, but for a small spirits brand like Midnight Moon the race could be a marketing bonanza. Piedmont's marketing budget is dwarfed by brands like Budweiser, Jim Beam, Jack Daniel's and Miller Lite, other alcohol brands in the race, but the link between moonshine and NASCAR, along with the Junior Johnson connection, means the car will get more than casual attention. NASCAR fans are also noted for strong loyalty in supporting products that sponsor teams. Piedmont Distillers is the only legal spirits distillery in North Carolina. In addition to Junior Johnson’s Midnight Moon it also makes Catdaddy Carolina Moonshine. That brand has also had involvement as a NASCAR sponsor. The brands are available in 12 states: North Carolina, Florida, Georgia, South Carolina, Illinois, Mississippi, Virginia, Wisconsin, Louisiana, West Virginia, Kentucky, Tennessee and Alabama. South Carolina state Rep. Fletcher Smith believes that members of the armed forces ought to be able to have a drink, even if they are not 21 years old. Rep. Fletcher plans to introduce a bill to allow military personnel who are 18 years old to purchase alcohol in the state simply by showing their military identification cards. South Carolina raised its drinking age to 21 in 1984 in part because of threats by the federal government to take away highway funding. Rep. Fletcher's bill could cost South Carolina millions of dollar in federal aid. Mothers Against Drunk Driving has come out against the bill and officials at military bases in the state say it is against the rules for anyone of any age to drink during basic training. Diageo PLC has added to its stable of vodka brands after buying a 50 percent stake in Ketel One vodka for $900 million. Diageo will partner with the Dutch Nolet family in a joint venture that gives the drinks giant the global rights to market and distribute Ketel One vodka. The deal comes as the Swedish vodka brand Absolut is on the auction block. Diageo also controls the Smirnoff and Ciroc vodka bands. The Tuscaloosa City Council plans to ask the Alabama Legislature for the right to allow residents to vote on selling alcohol on Sundays. The city leaders plan to meet with local state representatives to push them to get a set of measures passed, including the Sunday alcohol sales legislation. Tuscaloosa had a set of top issues introduced as bills during the in the 2007 Alabama legislative session, but all died when they were not voted on before the session expired. The Sunday alcohol sale legislation that Tuscaloosa is pushing would allow cities the same size or smaller to hold community referendums on the issue. Cities larger than Tuscaloosa already have alcohol sales on Sunday. The city budget in Bloomington, Ill., is running a deficit. The Bloomington City Council is trying to find $3 million to close a gap in a $75 million spending plan. They think that increasing the city tax on packaged liquor is just the ticket. In addition to raising the monthly garbage collection fee by $2, Bloomington officials want to boost the liquor tax from 2 percent to 4 percent. They say that would generate $300,000 towards the deficit. The also want to increase the penalty on retailers who are late in paying the liquor tax from 7.5 percent to 10 percent. The city is looking at increasing the garbage collection fee because, while it costs Bloomington $5.9 million a year for its garbage program, the current fee only covers $1.5 million of the cost. The hike in collection fees would generate another $600,000. To the casual mathematician it would appear that if everyone paid their fair share for garbage collection there would not be a need to raise other taxes. There is no Super Tuesday primary in North Carolina, but voters in the city of Locust will vote in a special election on Tuesday to decide if they will be permitted to buy alcohol in the community. There are 1,700 registered voters in Locust, which is located west of Charlotte, N.C. They will vote on allowing the sale of alcohol in restaurants, grocery stores and whether an ABC liquor store should be allowed in the community. Supporters of the measure say its passage would bring an Outback Steakhouse, a Harris Teeter grocery store and a hotel to the community. In addition to economic development the sale of alcohol would generate additional tax revnue for Locust. Free The Hops: Alabamians for Specialty Beer has been working for three years to try to get the Alabama Legislature to revise its backward rules on beer and lift the 6 percent alcohol by volume maximum enforced in the state. Similar efforts have been launched in other southern states and I can tell you that in my home state of North Carolina, where the Pop The Cap campaign was successful in changing the rules, the beer culture has flourished and there have been no widespread reports of people running naked through the streets. Free The Hops has not been able to get the job done, it says, in part because the local Anheuser-Busch distributor in Birmingham has been lobbying to block the legislation. Free The Hops (FTH) says Birmingham Budweiser first moved to stop legislation that would allow gourmet beer in Jefferson County and is working to stop a statewide bill that would allow high gravity beers to be available to consumers. The bill FTH wants passed would bump the limit to 14.9 percent alcohol by volume, which would open the doors to a number of domestic craft brewers, Belgian specialty brands and styles like barleywine and imperial stout. To fight back, Free The Hops has called on consumers to boycott all A-B products in the Birmingham area. According to their website: "FTH has called this boycott because of underhanded tactics of Birmingham Budweiser and its leadership in opposing local legislation which would legalize gourmet beer in Jefferson County." FTH called out Birmingham Budweiser Vice President Pat Lynch as the leader of the effort to block the craft beer bill. In addition to asking consumers to go Bud free, FTH is asking restaurants and retailers to stop selling A-B brands. Rallying in support of Alabama beer drinkers, the Sean Wilson of Pop The Cap in North Carolina sent an email to supporters this week urging them to call Birmingham Budweiser at 205-945-4893 and ask to speak to Mr. Lynch. The goal of the telephone campaign is to remind Lynch that "his position is inconsistent with a key message promoted in A-B's Here's To Beer" advertising and public relations campaign. When Jon over at The Brew Site announced that the topic for this month's edition of The Session was going to be Barleywine I became both excited and nostalgic. The excitement stems from the fact that barleywine is one of those styles that should start any beer fan's heart racing. Big and bold, these are brews that go for the gusto. Barleywine gets my vote for the most likely to induce palate fatigue at a beer festival. About as far away from a session beer as you can get, barleywine is a true classic. The style has to be in the high gravity hall of fame. The nostalgia comes from my first early encounters with barleywine. I was a student at Syracuse University and lucky enough to snag a spot in the school's semester abroad program in London. My first time on an airplane was a flight on TWA from JFK in New York to Heathrow in London. It was a great experience in many ways and I came to understand and enjoy the British pub culture and bitter. I also saw the strange nip bottles behind the bar and sampled something amazing called barleywine. The most widely available were two Watneys' brands, Stingo and Gold Label. The flagship Watneys Red Barrel was not well liked by the locals, but they did appear to enjoy Stingo towards the end of the evening. Weyerbacher Blithering Idiot Barley-Wine Style Ale: This Easton, Pa., brewery produces a very impressive set of beers. Blithering Idiot has one of those great barleywine names that sticks. A slightly cloudy and almost cider-like color, Blithering Idiot is 11.1 percent alcohol by volume. It has a fluffy head to start and a sweet nose. You get hints of tart citrus and perhaps a little sweet cherry in the flavor profile. The alcohol is present, but it is a fairly smooth drink. Talon True Style Barley Wine Ale: I picked this one over a trio of other great options from Victory, Left Hand and Avery because it is brewed at Mendocino's brewery in Saratoga Springs not far from where I used to live in Upstate New York. If you ever find yourself in Saratoga Springs, especially if you have dropped money at the Saratoga Race Course or the nearby racino, head to the brewery's tasting room for one of the best deals in town. For $2 they will pour you a pint of any of the beers they happen to be making at the brewery -- there are usually about 10 beers on tap -- and they let you keep the glass. They limit you to two beers, but if you are drinking Talon, that's all you'll need. Talon is a dark reddish hued, malty brew with 10.5 percent alcohol by volume. The bomber bottle I poured from delivered a very thin head, but the body of the beer made up for it. While I would say the beer has sweet notes, it also finished fairly tart and dry. The ale yeast in this beer is clearly present and defines the overall fruity character. Mikkeller Big Worse Barley Wine: Brewed at De Proef Brouwerij in Lochristi-Hufte, Belgium, for a pair of Danish homebrewers, Big Worse is 12.0 percent alcohol by volume. The beer is dark red, with a thin head. The brewery uses candy sugar as part of the recipe and the initial nose has some sweet, floral and herbal notes. This is a bit more hoppy than most barley wines and I would say it is a touch less complex than the two others in this tasting. While it was the most alcoholic of the three barleywines I tasted, the alcohol was cloaked. Certainly, the average drinker would know it was something more than a lager, but perhaps not think it much more powerful than a good solid IPA. Hey did I remember to thank Stan over at Appellation Beer for starting The Session? We all should.